Start working off Thanksgiving dinner a little early and help out a great local organization as the Bizz Running Company hosts the 6th Annual Thanksgiving Day Turkey Trot on November 22nd. Families and children are encouraged to participate in this fun 3.1 mile race which will begin promptly at 8:30a.m. 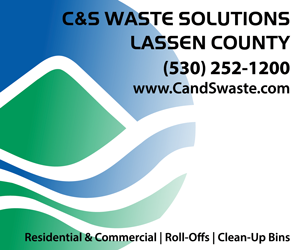 at Lassen Superior Courthouse, 2610 Riverside Drive in Susanville. 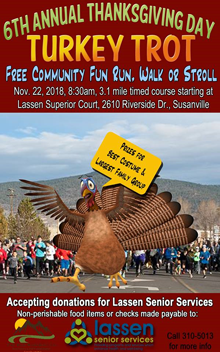 There is no cost to enter, however, participants are asked to bring a non-perishable food item or donation for Lassen Senior Services. To be a part of the fun Thanksgiving morning event you must download and complete the waiver and bring it with you. Click here to download the waiver. 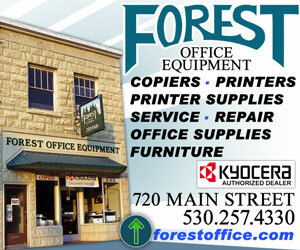 If you would like more information or have questions please contact Linda at (530) 310-5013.